This USB 2-Port Serial Adapter is designed to make serial port expansion quick and simple. Connecting to a USB port on your computer or USB hub, this USB 2-Port Serial Adapter instantly adds two RS422/RS485 serial communication ports to your system with easy plug-and-play and hot-plug features. Plugging the USB 2-Port Serial Adapter into the USB port, the adapter is automatically detected and installed. There is no IRQ & COM port conflicts, since the port doesn't require any additional IRQ, DMA or memory on the system. The RS-422/485 serial ports functions as native Windows COM ports, and it is compatible with Windows serial communication applications. This USB 2-Port Serial Adapter provides instant connectivity to any RS-422 or RS-485 communication devices. Uses an FTDI brand chipset. 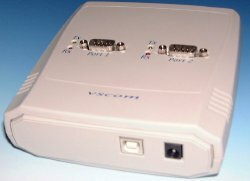 This model supplies Optical Isolation & Surge Protection. Each RS-422/485 port is individually optically isolated with 2000 volt DC optical isolation. The optical protects your PC or notebook from spikes and surges on the RS-422/485 network, by converting the electrical pulse into an optical signal and then changing it back into an electrical pulse. Your computer is well protected, since the surges and spikes cannot cross the optical link. Each RS-422/485 port is individually protected by surge protector to withstand electrostatic discharge and power surges up to 25KV ESD. Surge suppression on all signals prevent damages caused by lighning and high voltage. In Stock and On Sale! This item is normally $148.00. Limited quantities available at this price. Comes with a USB cable & power supply (230 volt, 50 hz). This type of power connector is used in the following countries: Albania, Algeria, Angola, Argentina, Austria, Azores, Balearic Islands, Bangladesh, Belgium, Bolivia, Bosnia, Brazil, Bulgaria, Burkina Faso, Burundi, Cameroon, Canary Islands, Cape Verde, Central African Republic, Channel Islands, Chile, Comoros, Congo, Croatia, Dem. Rep. of Congo (Zaire), Cote d'Ivoire (Ivory Coast), Cyrpus, Denmark, Djibouti, Egypt, El Salvador, Equatorial Guinea, Eritrea, Faeroe Islands, Finland, French Guiana, Gabon, Germany, Gibraltar, Greece, Greenland, Guadeloupe, Guinea, Guinea-Bissau, Hungary, Iceland, India, Indonesia, Iran, Iraq, Isle of Man, Israel, Italy, Kazakhstan, Korea, Kuwait, Laos, Lebanon, Lithuania, Luxembourg, Macedonia, Madagascar, Madeira, Mali, Martinique, Mauritania, Mauritius, Monaco, Morocco, Mozambique, Myanmar, Nepal, Netherlands, Niger, Norway, Oman, Pakistan, Paraguay, Peru, Philippines, Poland, Portugal, Romania, Russia, Rwanda, St. Vincent, Senegal, Serbia, Slovenia, Somalia, Spain, Sudan, Suriname, Sweden, Switzerland, Syria, Thailand, Togo, Tunisia, Turkey, Uruguay, Vietnam, Yugoslavia (former), Zambia. Click here to view this type of plug. This type of power connector is used in the following countries: Bahrain, Bangladesh, Belize, Botswana, Brunei, Cameroon, Channel Islands, China, Cyprus, Dominica, El Salvador, Gambia, Ghana, Gibraltar, Grenada, Guatemala, Guyana, Hong Kong, Iraq, Ireland, Isle of Man, Jordan, Kuwait, Lebanon, Macau, Malawi, Malaysia, Maldives, Malta, Mauritius, Myanmar, Nigeria, Oman, Qatar, St. Kitts-Nevis, St. Lucia, St. Vincent, Saudi Arabia, Seychelles, Sierra Leone, Singapore, Tanzania, Uganda, United Arab Emirates, United Kingdom, Vietnam, Yemen, Zambia, Zimbabwe. Runs off of USB power, no power adapter necessary. Product dimensions: 115 x 84 x25 mm (W x L x H), 137 x 84 x 25 (W x L X H) with DB9 connectors and ears. This USB 2-Port Serial Adapter with surge protection & optical isolation is designed to make serial port expansion quick and simple. Connecting to a USB port on your computer or USB hub, this USB 2-Port Serial Adapter instantly adds two RS422/RS485 serial communication ports to your system with easy plug-and-play and hot-plug features.